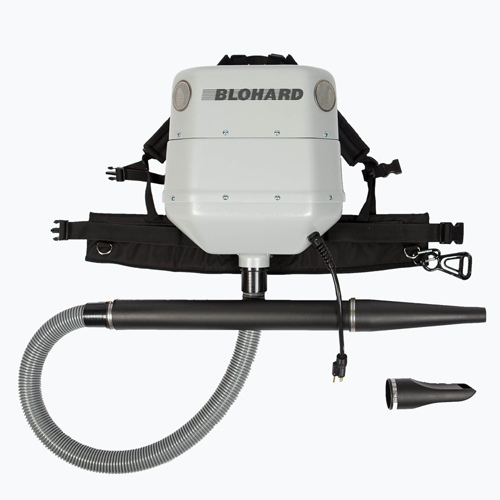 The BLOHARD® the “Made In America” powerful, lightweight, electric backpack blower you've been looking for. We Don’t Call It Blohard For Nothing! This lightweight 2.8 horsepower electric backpack blow-cleaner has powerful twin motors which produce a forceful blast of pressurized air, making the Blohard capable of moving even heavy objects. It is constructed of durable, high impact polymers and features exceptional low noise yield. Blohard comes with a 2.0” polyurethane 5-foot hose, a wand, a straight nozzle, and a curved nozzle. It also comes with a harness system consisting of a padded waist belt, padded shoulder straps, and machine isolation plates for a comfortable custom fit. Blohard has two speeds for power control and comes with a one-year limited warranty. So when your needs call for a power-house, remember, we don’t call it Blohard for nothing. A new large opening low pressure nozzle is now also included for light blowing where dust needs to be controlled.